Quotes from articles are much more eye-catching than links on Twitter, so the social giant is scooping up the team behind highlight-sharing app Highly. This talent could help Twitter build its own version of Highly or develop other ways to excerpt the best content from websites and get it into the timeline. Twitter confirmed to TechCrunch that the deal was an acqui-hire, and a spokesperson provided this statement: “We are excited to welcome the Highly team to Twitter. Their expertise will accelerate our product and design thinking around making Twitter more conversational.” We’ve asked about what data portability options Highly will offer. Highly will shut down its iOS and Slack app on April 26th, though it promises that “No highlights will be harmed.” It’s also making its paid “Crowd Control” for private highlight sharing plus Highly For Teams free in the meantime. “Social highlights can make sharing stories online feel personal, efficient and alive — like retelling a story to a friend, over coffee. They give people shared context and spark meaningful conversations,” the Highly team writes. Quotes can make the difference between someone breezing past a link they don’t want to leave Twitter to explore, and getting a peek at what’s smart about an article so they know if it’s worth diving deeper. Many people use OneShot to generate Twitter-formatted screenshots of posts. But Highly lets you just rub your finger over text to turn it into an image with a link back to the article for easy tweeting. You could also search an archive of your past highlights, and follow curators who spot the best quotes. 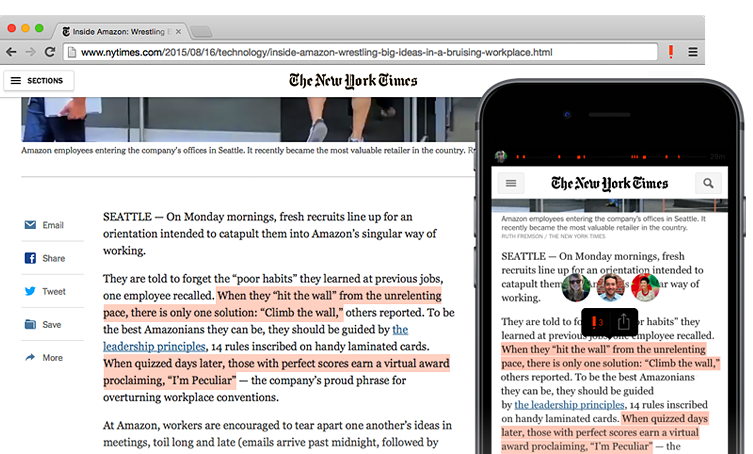 Its browser extensions and native app let you highlight from wherever you read. “Sharing highlights, not headlines — sharing thinking instead of lazily linking — helps spark the kind of conversation that leaves participants and observers alike a bit better off than they started. We’d like to see more of this,” the Highly teams writes. That’s why it’s joining Twitter to work on improving conversation health. Founded in 2014, Highly had raised a seed round in 2017.